As the local food movement grows, the number of farmers’ markets has been increasing, especially in Europe and the North America. According to the U.S. Department of Agriculture (USDA), 8,268 markets were listed on USDA’s National Farmers’ Market Directory in 2014, an increase of 76% from 2008. At a farmers’ market, consumers can buy fresher, healthier, seasonal, locally grown food at cheaper prices, while farmers can sell their products independently, and directly to consumers, earning more profit without the need of a middlemen. A farmers’ market is also an opportunity for the community to meet neighbors and build a social connection between farmers and consumers. 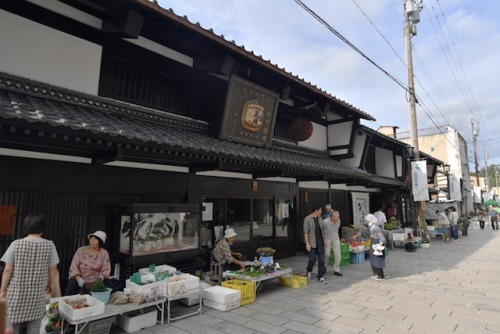 430-year-old morning market in Ono, Fukui (Shichiken-Asaichi) from echiwa on Vimeo. Ono (大野), a snowy town surrounded by mountains in eastern Fukui, has a much older history with farmers’ markets. 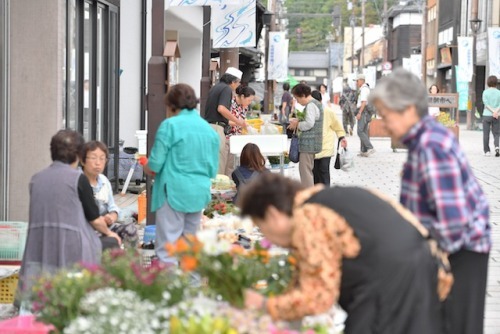 The local morning market known as the Shichiken-Asaichi (七間朝市), has been bringing farmers and consumers face to face for more than 430 years. Ono’s streets are laid out in a grid pattern much like Manhattan, only Ono’s were built in 1573. 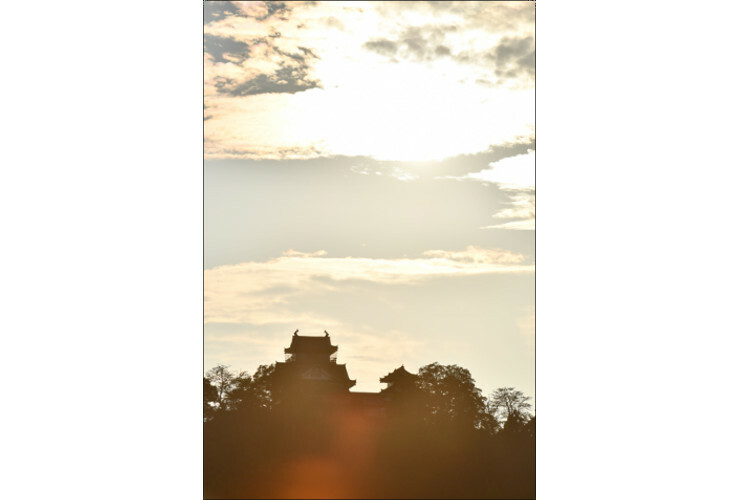 Back then, a vassal of Oda Nobunaga named Nagachika Kanamori, built Echizen Ono Castle on top of the 249 meter tall Mt. Kameyama. This castle is often called “the castle in the sky”, because on certain foggy mornings it looks like it’s floating on a sea of clouds. The Shichiken Street was first established at the foot of Mt. 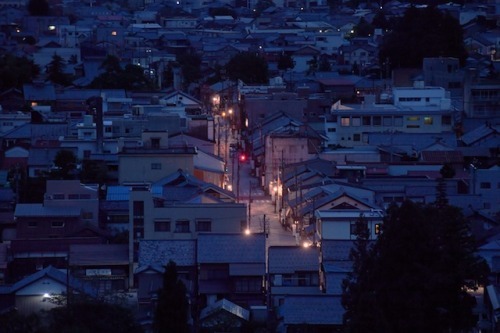 Kameyama as the city’s main street, where local craftsmen and merchants worked. 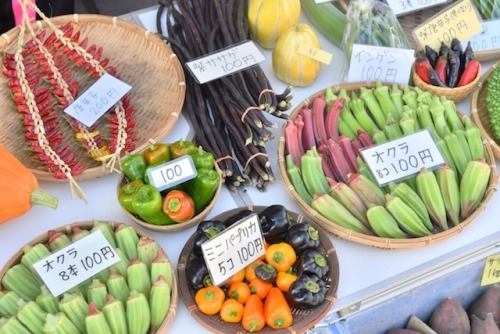 Local farmers founded the morning market, Shichiken-Asaichi, and began to sell their fresh vegetables on the street there. Shichiken-Asaichi opens every morning from the vernal equinox (around March 20) to new year’s eve (December 31). At around 5:30 a.m., local farmers come to the market with the fresh fruits and vegetables harvested earlier that morning, and sell them at each stand until 9:00 a.m.. Various kinds of vegetables, such as tomatoes, pumpkins, corn and garlic, as well as seasonal vegetables like edible wild vegetables in spring and taro in autumn, are available at cheaper prices. 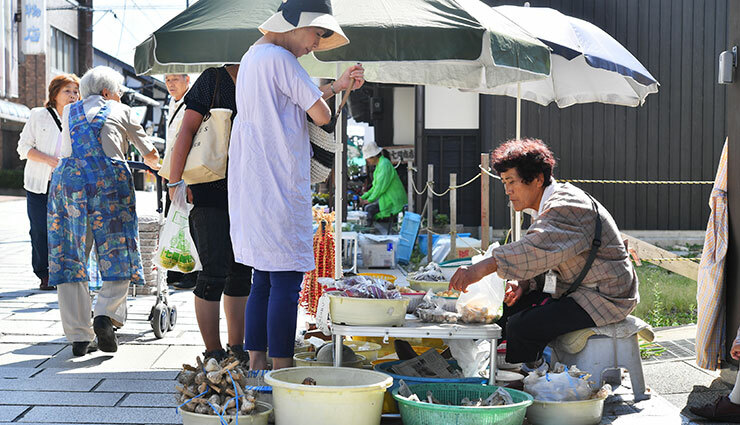 Everyone, from local elders out for their morning walks, to businessmen and women on their way to the office, even tourists from other parts of Japan visit the market. Local farmers warmly welcome visitors, telling them their recommendations of the day and offering them some tips for cooking. 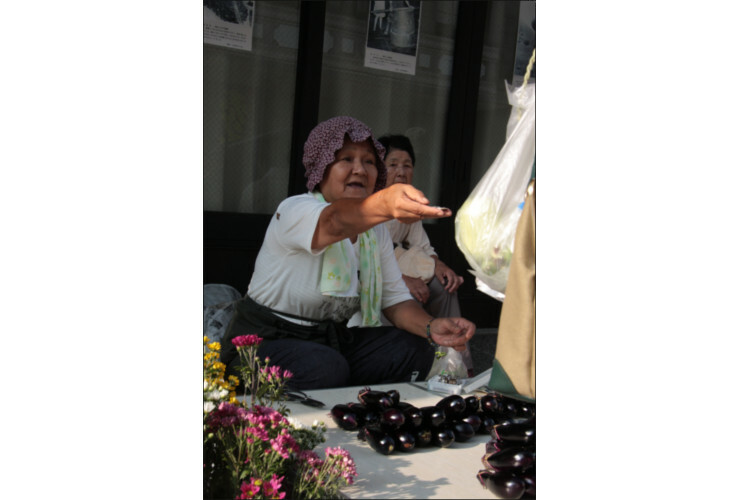 Shizuko Chido is one of the well-known faces at the market. She has been opening her stand every morning for more than 10 years, enjoying talking with visitors. Her friendliness makes her shine, even on cold, cloudy mornings. Many of her regular customers drop by her stand every day. The shiny fresh eggplants, which were harvested at her farm earlier in the morning, are sold one after another. She always thanks nature, believing that she makes her life by the grace of the fields and mountains. After her business at the market, she sometimes visits her customers in person and gives them surplus food for free if she has any leftover. At 6 a.m., we met one lady who visited the market for chrysanthemums. As you may know, chrysanthemums are special flowers to be offered to a family Buddhist altar in Japan. She said, “I always buy chrysanthemums here at this morning market when my flowers have withered. 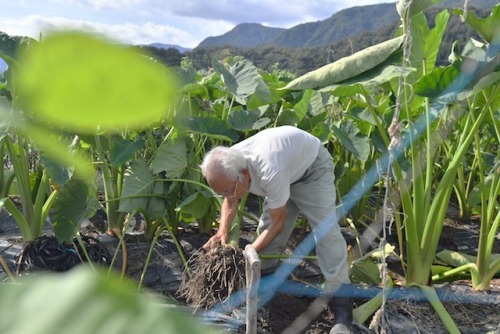 I want to offer fresh ones to the altar at the beginning of the day.” Shichiken-Asaichi has been a part of the daily life for local people in Ono. At the morning market, the street was crowded with many stands until 20 years ago, satisfying the food demand of the local people. 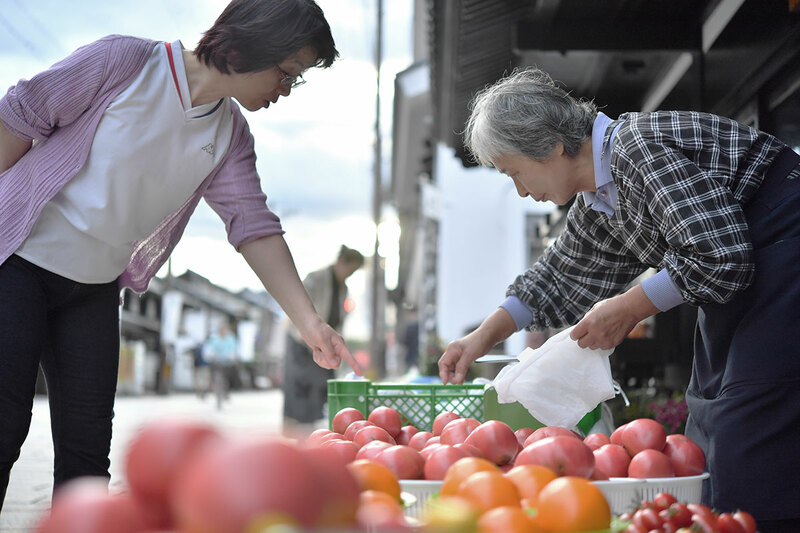 Although the number of stands has been decreasing due to the aging population here, it is still one of the best places to buy local food, and a community meeting place for local people to gather. It is also an interesting place for visitors to learn about the local people and get to know their daily life.